Planning repair, you, for certain, already familiarized with a large number of recommendations for choosing a tile for a bathroom. We would like to draw attention to the details that are sometimes overlooked, although they may affect the perception of the interior of the entire apartment as a whole. Here are some tips on how to choose a tile for a bathroom in terms of style, color, size and other parameters, based on our experience in the design of bathrooms and toilets. We are for the interior of all rooms of the apartment to be decorated in the same style. 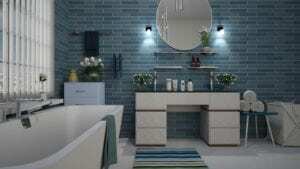 The design of the bathroom and bathroom should also fit into the overall picture. The classic interior involves the selection of tiles with marble texture and stucco decor, gold mosaics and intricate patterns are suitable for Oriental style, and minimalism does not tolerate excessiveness in colors or textures. If you do not want to adhere to the same style throughout the apartment, combine the bathroom with other rooms with a theme. Now on the market there are many thematic collections of ceramic tiles for every taste: beaches, sea, landscapes, cities, animals, birds, paintings, etc. Consider the color of the whole apartment. If the other rooms are decorated in beige and brown colors, and for the bathroom you have looked for a fun yellow-green or mysterious purple-black tile collection, the contrast will be evident. Pay attention to the color of the door. If it does not harmonize with the color of the tile, try to at least find the bathroom furniture in the same color and the same texture as the door leaf. A door that stands out against the background and an unmatched door can completely destroy the charm of your bathroom. The more family members live in the same apartment, the more taste preferences will have to be combined. If there is disagreement regarding the color of the tile, it is better to dwell on neutral shades that will not annoy anyone. Dark-colored tiles for small bathrooms are best used only as decor, otherwise it will depress you. Black, brown and dark gray can give your skin an unhealthy shade. Dark floor tiles will have to be washed more often, since the slightest dirt will be visible on it. White color creates a feeling of a hospital atmosphere, so it is better to dilute it with bright blotches, for example, panels or borders. The beige color in the interior of the bathroom is boring, but there are collections that, with their unusual features, can make the design of the bathroom quite interesting. 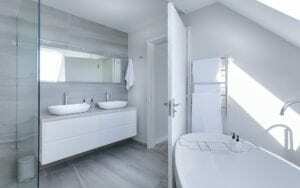 For a small bathroom, you should not choose tiles with a width of more than 19.68 inch. Italian, Spanish and other foreign tile manufacturers are oriented towards the owners of private houses, rather than small apartments, which is why large tile sizes are more common in their collections. Consider the size of the walls of your bathroom to determine which tile widths will be more economical to fit with the minimum number of undercuts. Do not forget about access to communications. You can hide it with roller shutters with photo printing, but this option is more suitable for narrow toilets (see photo above). In the bathroom it is better to use a sanitary flap – “invisibility” under the tile. In this case, it is desirable that on the flap fit a whole number of tiles without trimming. Only in this way it will harmoniously fit into the bathroom. You can choose a tile for the bathroom and order a free layout in the store where you plan to purchase it, but the store manager is unlikely to take into account the above details. In addition, the consultants of the stores interested in selling more expensive collections or decor (curbs, mosaics, panels) will offer you more profitable layouts for them and convince you that they are right. Remember that in case of difficulties and if you want to make a quality repair, you can always seek advice and help in the design of the bathroom to a professional designer.